Sargam Griffin is a German born painter who lives and works in Healdsburg, Sonoma. She has been painting for over 20 years, perfecting a technique that is visually expansive, energizing and illuminating. Her artworks radiate with an aching sense of passion and belief in the subjects, emotions, and messages that they explore. After many years of work, Sutter Medical Center’s new $284 million dollar hospital is due to open this year, next to the Wells Fargo Center for the Arts. I am grateful to have been awarded the commission to create two large-scale abstract paintings that will welcome patients, doctors, nurses and the community at large as they enter this healing space. The first artwork will be installed near the birthing center and is my personal interpretation of quality care and its future. My vision will encompass the spiritual, emotional and physical sides of this subject. 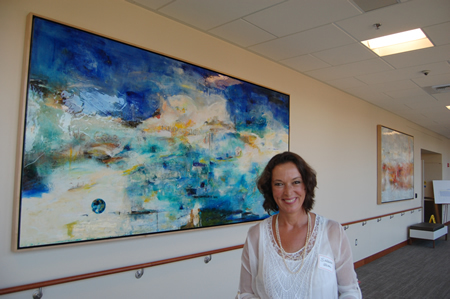 The second painting engages the Sutter health employees directly. During a gathering, where I was able to meet the doctors, nurses and health workers, the blank panel was also present. Throughout this event, the employees wrote heartfelt messages to their patients on the back of the board. These people spend most of their lives healing others, creating bonds, supporting their families and working within a complex and changing healthcare system. On a daily basis they navigate emotions that most of us may face only a few times in our entire lifetime. It is fitting that they should have a deep influence on this artwork. The experience of this is both touching and memorable. It provides a constant sense of inspiration that will be expressed directly through this piece. My paintings evolve over time. As the painting process develops, so does the depth of my involvement with the subject itself. This conversation between myself, the subject and the act of painting is built on in the relationship with the people that will see them on a daily basis.